Last week, boyfriend Jared and I took a trip to Portland, Oregon. We went with the intention to "disconnect while we reconnect". Too often, Jared works late nights while I operate my business during the daytime when clients are most available, leaving little time to spend together aside from our one or two days off each week. I decided one Thursday to surprise Jared with a mini getaway to our second favorite city. I reserved a Bed & Breakfast package at River's Edge Hotel & Spa (one of the largest spas and recreation centers in Portland) which included $25 credit to their brand new restaurant, Rosswood and a river's view King room in their remodeled, modern hotel. We started our day by visiting Blue Star Donuts (I learned that Blue Star is the TRUE locals' favorite, ask any resident and they'll tell you that VooDoo is the tourist's spot that doesn't accurately present the best of the best in Portland). We loaded up on the flavors that sounded the best to us and skipped out the door! (Pro Tip: the best doughnut BY FAR is the raspberry rosemary buttermilk - that bright pink one in the bottom right corner in the photo to the right here). Next up was Pistils Nursery - full of all sorts of tonics and salts, plants and crystals. My dream store, in other words! Jared and I crafted a succulent and cacti terrarium complete with moss, salts, rocks and crystals. Dusting off our little succulent babies with the cute little terrarium brush was the most fun - I'm not gonna lie! I also picked up some loose crystals and a bottle of Aquarian Soul's New Moon Bath Soak which I plan on using in our anticipated new home come summertime. Gimme those #goodmoonvibes! Then, we attempted to check in to the hotel but we arrived around lunchtime and they didn't have a room available for us yet (I'm the notorious early check-in-er that always calls ahead of time! ), so the very nice valet parking man suggested that we try out Elephants Delicatessen - an awesome local deli that prides themselves on serving "Great Local Foods from Scratch". Having not touched our doughnuts yet, you best believe WE WERE STARVING! Next on our list was to digest and return to the hotel in our spa mood! We had booked two treatments: a Couple's Rose Garden Soak and 60 Minute Couple's Massage. We got to the spa a little early, so we went into our designated gendered areas for some relaxing magazine reading, showers and the optional jacuzzi and sauna. Can we just take a moment to appreciate how gorgeous this spa is!? Our Rose Garden Soak consisted of a bubbly jacuzzi in a private room, real rose petals everywhere, mocktails and delicious local Moonstruck chocolates. They even left us ice cloths just in case! I took home the full rose flower that they left on our robes and keep it near my crystals. After our relaxing (but exhausting) massages, we checked in at the hotel and took a good 3 hour nap to recuperate. When we woke up, it was time to head to the McMenamins Kennedy School Theatre - a quaint old building with ample space, a full restaurant and bar, as well as theatre where they serve you the full McMenamins menu - right to your seats! That's right. You can nosh on high quality burgers, pretzels, tots, pizza, the list goes on, while drinking beer, wine or cider right at your seat! Your seat is most likely an old, velvet couch, too. It's kind of everything. We watched "The Post" - bravo, Meryl Streep and Tom Hanks! You guys, they are a dream team! If you haven't seen the flick yet, highly recommend. After the show was over, we headed back to the hotel for some much-deserved rest. We woke up promptly at 7:30 a.m. the next morning and walked over to the hotel restaurant for breakfast. When they say River's Edge - they mean just that! The views are gorgeous. I ordered the avocado toast with poached eggs, a side of fresh fruit and some grapefruit juice (which was SO fresh, you could taste the pulp!). After breakfast, we stopped by our favorite place to grab a drink for the long ride home: the Tea Bar! We always order the cocoa cinnamon boba milk tea - TO-DIE!! All in all, this trip was a beautiful time for reconnection and disconnecting from our devices. 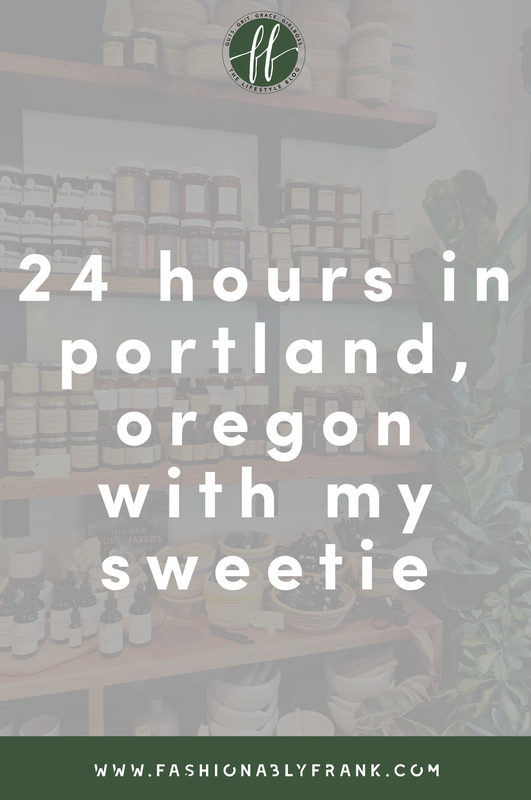 We adored the memories we got to make over the 24 hours we spent in Portland! Tell me, what are your favorite things to do in Portland?